First, I hope you’ll join us at KLRU NEXT on Thursday, April 6 from 6:30 – 8:30 at Springdale Farm to build your own terrarium from Slavonk & Hortus Terraria, grab a drink from Live Oak Brewing Co. and Z Tequila and enjoy bites from Eden East. Baylor Scott & White Health will be on site giving healthy cooking and medicinal herb demos! Cost: $15 Fun: Priceless! RSVP here! Fennel isn’t native, but it’s mighty tasty to Eastern Black Swallowtail butterfly caterpillars! Pat and Tom Ellison grow this just to get those butterfly beauties. You can see their whole fantastic garden on May 6. When taping at the Festival Beach Community Garden, bees and ladybugs were feasting like crazy on annual borage. We, too, can eat the flowers or garnish drinks and harvest young leaves for salads and to dry for teas. In my garden, bees are making a beeline for perennial Brazos (or Gulf) penstemon. Gulf Fritillary butterfly took a lunch break on my native coneflower (Echinacea). This week, Andrea DeLong-Amaya from the Wildflower Center shows how to slice off a bit of Echinacea root to boost your immune system. She and Tom pick a few native plants to turn into delicious recipes. Did you know that pink evening primrose leaves are a yummy green? Andrea crafted crackers and cheese topped with pink evening primrose leaves and wild onion (Allium canadensis). They never made it out of the studio! The Lady Bird Johnson Wildflower Center, in collaboration with UT Green Corps, is growing native plants in a farm-style setting. Dubbed A Taste of Place, get all their recipes online. At Taste of Place, also discover how to forage wild plants and turn into recipes like prickly pear margaritas. My chile pequins have already rebounded from winter. When fruits are ripe, I’m heading to Taste of Place for their chile pequin and wild onion cornbread recipe! Watch now! And pick up your edible native plants (for you and wildlife) at the Wildflower Center’s Spring Sale on April 7 & 8. When we taped at the Festival Beach Forest in east Austin last Saturday, we spotted elderberry in bloom. Once its berries form and ripen, people strolling by can pluck a quick snack. Long ago, I got my first native Barbados cherry (Malpighia glabra) at a nursery that jumped on the native plant bandwagon early. These shrubby trees can brown up in Zone 8 or 9 winters, but quickly return. I prune them for shape and to keep them in bounds, since they can easily top 6’. I’ve also got the dwarf, mounding version, Malpighia glabra ‘Nana’ (or something similar) that I consider a groundcover. Here’s one at the Travis County Extension demonstration garden. Barbados cherry is great for sun to part shade, producing simultaneous flowers for pollinators and fruits for birds and us! And it’s very drought tolerant and supposedly deer resistant. Get all of Daphne’s tips. 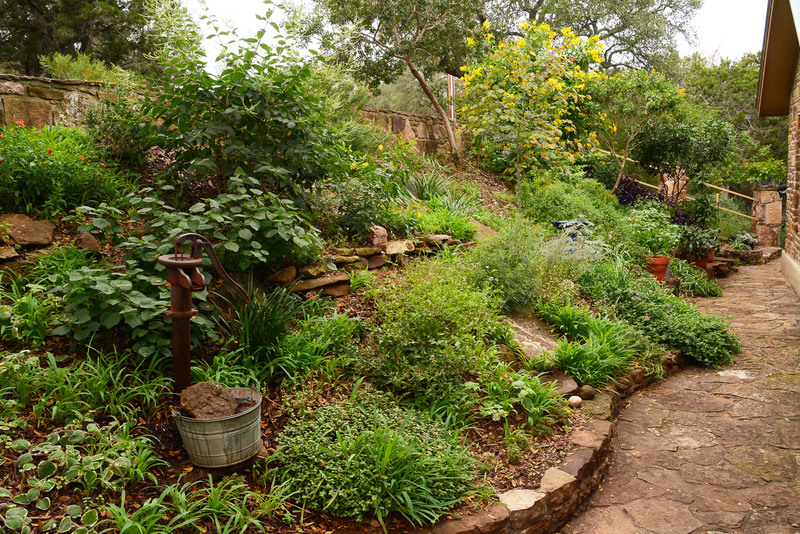 Sure hope you can skip by the East Austin Garden Fair on Saturday, May 8, where Extension and Master Gardeners will host informational booths and give away plants and seeds. The City of Austin offers free soil testing for hazardous materials. Before you banish wild purslane (Portulaca oleracea) from your garden, Trisha explains the taste and nutrition that you’re missing. Watch now! Often, transplanting native plants can be tricky, especially mountain laurels. Perhaps that’s why they took so long to show up in the nursery trade? When Jason Wisser in Driftwood transplanted some from around his property, all was going well until they became chlorotic and started dropping leaves. Daphne explains what happened: “Texas mountain laurels are notoriously challenging to transplant, and the symptoms here are classic signs of transplant shock with this shrub.” Find out more. On tour at Austin Aquaponics, Rob Nash chose aquaponics when he turned farmer. For one thing, he lives on rocky land in Spicewood where regular farming isn’t practical. Aquaponics combines aquaculture—raising fish—and hydroponics—soil-less agriculture. He also wanted to conserve water and provide year-round crops to his customers from his broad greenhouses. Wife Lacy, a preschool teacher, and daughters applaud his mission for healthy, local and resourceful food. And hey! Come join me at Mayfield Park’s Trial and Error Symposium on April 1 for great talks, plant sales and raffle. Find out more.